Background A care bundle is a group of evidence based interventions which if consistently delivered should improve outcomes. 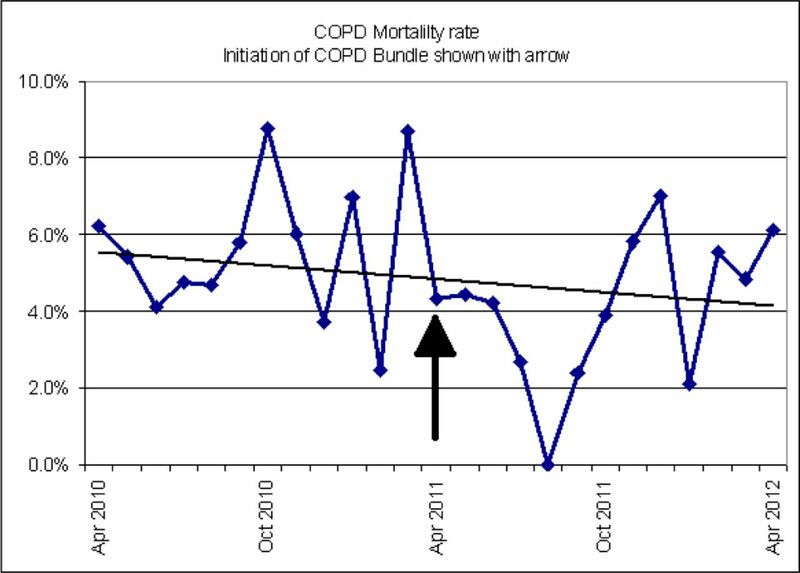 Published work (Thorax 2012) has demonstrated the impact of a COPD discharge bundle on hospital readmission rates. There is no published information on the use of bundles to address in-hospital mortality for COPD. Methods In April 2011 a care bundle for acute exacerbation of COPD (AECOPD) was introduced at both acute hospital sites in our Trust. The bundle content was printed on an adhesive sticker which was placed in the case notes. It consisted of a 7 point acute care section, completed on admission, and a 10 point discharge section completed prior to discharge. Multidisciplinary training and intranet guidance was provided to staff. Bundle use and compliance with each element was assessed quarterly through audit of 50 consecutive admissions. Hospital readmission rates and mortality were also reviewed. Results Audit was undertaken in October 2011, January 2012 and April 2012. Bundle stickers were reliably placed in the medical notes (>80%). Delivery of all 7 admission bundle elements was high in each audit (>75%), but compliance with the timings required fell during the ongoing audit (56%; 24%; 26%). Compliance was higher in patients admitted through A&E compared to those admitted directly to MAU Compliance with all 10 discharge bundle elements initially improved but was not sustained (26%; 74%; 35%). Site specific comparison indicated that discharge bundle delivery was better with a hospital based respiratory specialist nursing “outreach” service, than with a community based “inreach” service. Overall compliance with all 17 bundle elements fell during the year (24%; 26%; 5%). Readmission rates compared to the previous financial year fell from 14.9% to 12.8%. Mortality rates also fell (figure). Conclusion Despite the lack of full compliance with the bundle, it was well used and improved outcomes were seen in terms of mortality and readmissions. It was felt that the bundle acted as a focus for improving knowledge and delivery of COPD care. Regular training and encouragement of staff will be required to sustain compliance with use of the bundle.